It’s a tough challenge up in Sydney but one we’re looking forward to. BRAYDON Preuss will get the chance to pull on the red and blue guernsey for the first time on Thursday night as the Demons make two changes to their side to face Sydney. The former Roo has been included in Melbourne’s final 22 alongside midfielder Billy Stretch, as the Dees look to secure their first win of 2019 at the SCG on Thursday night. But with the pair coming in for the Round 4 clash, Alex Neal-Bullen has missed out on selection. Kade Kolodjashnij has also been withdrawn from last week’s side after dealing with symptoms of concussion following last Friday night’s game. Despite a poor start to the season, assistant coach Troy Chaplin is confident this Demon outfit can return to their best against the Swans this week. “We’re probably in a position where we don’t have the luxury of making too many changes,” Chaplin told Melbourne Media. “We’ve got some injuries and we’ve got to get some form from guys in the VFL to knock on the door. “We’re here to help them as coaches, but they’ve been doing the work, so we’re looking for them to bounce back this week. Preuss, aged 23, played eight AFL games for North Melbourne in 2017 before seeking a trade to the Demons at the end of last season. 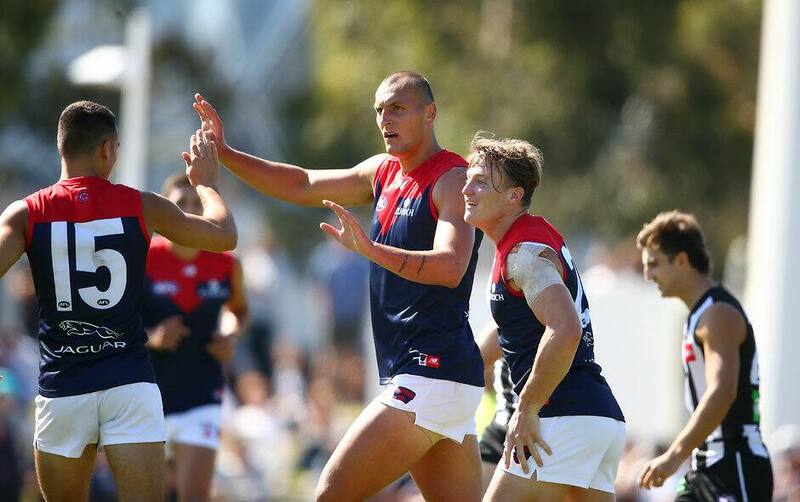 The versatile ruckman, standing at 206cm, will provide a tall target inside 50 for the Dees and will offer some support for Max Gawn in the middle. “Preussy will play his first game for the club and we’re pretty excited by it, and I know Maxy is looking forward to playing alongside him as well,” Chaplin said. “We’re just looking for a different look up forward and it probably aids Maxy a little bit as well. Chaplin is equally as pleased for the hard-working Stretch who has finally cracked his way back into the side. The 22-year-old has earned his first shot in the ones since injuring his foot against the Dockers in Round 16 last season. “Billy’s had some injuries … so it’s been a while for him,” Chaplin said. “Billy deserves his opportunity and we’re really hoping he can solidify his spot at AFL level. Stretch has played 38 games for the club since being drafted in 2014 and has earned his re-call through some consistent form in the VFL. In more positive news for the Dees, Tom McDonald has been cleared to play after plenty of speculation surrounding the key forward’s fitness this week. After rolling his ankle against the Bombers last Friday, McDonald passed a fitness test on Wednesday and should be fit to play his 150th AFL game. “It looks like Tommy will be right to play,” Chaplin said. With an extended squad travelling to Sydney on Wednesday, Neal-Bullen will be one of four emergencies for the match, along with Charlie Spargo, Marty Hore and Harry Petty.